I'm pretty sure we have established that frugal = green 9 times out of 10. We're getting ready to go back to school, like most families in America/Canada. And back to school can be pretty darn costly. For my three- first and second graders I spent almost $100 on school supplies. That does not include backpacks and lunchboxes. 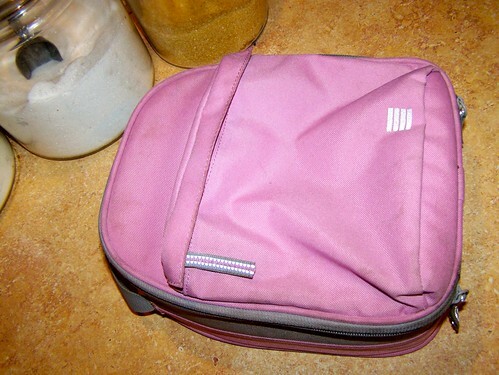 Mostly because their backpacks and lunchboxes from last year are in perfectly good, usable condition. My kids are raised in this society too, and they have been conditioned to believe that they need new stuff. But, then what would become of the perfectly good, usable lunchboxes we have? And why should I spend another $100+ on new ones? But, I get it. I'm in school myself. I got a little giddy in the office supply store buying new pens and folders and highlighters. It's nice to start out the new year with new stuff. But, once I told them that we could and would take the whole family to the minor league baseball game with concessions for everyone for the price of replacing just two backpacks, suddenly the value began to make sense. But again, I sympathize. 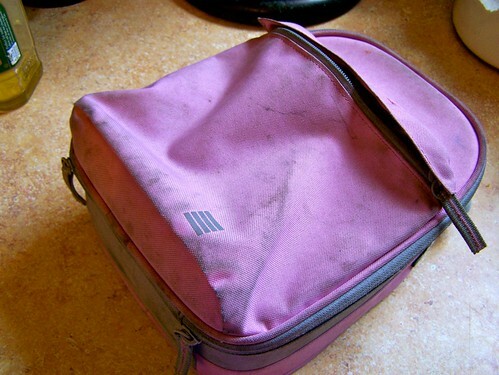 You don't want to start out the school year with your lunchbox looking like this. We wet them down with a little water and then sprayed it with some Whatever and took a little scrub brush to it. After a quick rinse and a nice dry in the sun, they may not look just like new, but pretty darn close. I posted earlier about eco-friendly (aka frugal) lunchbox packing options and this year I have ordered a couple more from Etsy, because I have begun to use them for toddler snacks and leftovers at home. I really like these because of the extra big size and the affordable price. As far as what to pack in those lunchboxes, our children's school does not have food service and so they have to bring lunch everyday (and two of their classrooms are peanut-free). I personally prefer this, because we've all seen the typical school lunch, right? But, it is easy to run out of ideas. I'm lucky because my kids have no issue eating leftovers. They actually ask for them. crazy, I know. But there are some great websites that have some easy recipes and ideas for school lunches.